Informtainment.com by ORLANDO: Slash: Next!! In todays fast paced music industry more and more up and coming young artiste have been displaying a keen sense of professionalism, using every bit of information to their advantage, investing time and effort into their skills. 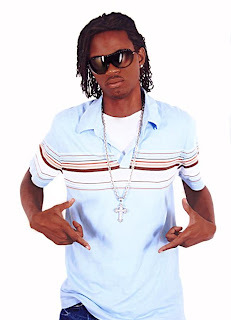 One such newcomer to the business is Dwayne Knight more popularly known as Dancehall recording artiste Slash. A native of the West Meade community of Portmore Slash began his musical journey at a young age this as a result of the inspiration he got from influential people like Michael Buckley, a sound system operator who lived in his neighborhood. "I remember I use to get a chance to express myself and it was things like that that helped me to further develop as an artiste". Back then Slash was living in a family household, the fifth of seven siblings he was no different from the typical youngster growing up. A former student of the Bridgeport High School Slash was the admiration of his teachers and peers and in 1996 at the age of 14 turned his relentless drive to be a deejay up a notch by penning his own lyrics and even boasting a counteraction some time after of veteran deejay Red Rat's classic hit "Mi Woulda Shame". Next it was time to hit the streets and that he did building networks on the party circuit until he former a group called CellBlock with the help of record producer Ray Stephens of the then Dog House Productions now Vertex Records. The new link would see Slash brushing shoulders with dancehall heavyweights Aidonia and Vybez Kartel who after a business deal brought Slash into his then label Adijahheim. Under that label Slash increased his visibility both mainstream and on the streets, recording the song "Bad Man Nuh Bow" that same year alongside Kartel. He later got his first video feature on the same Young Gunz Medley which was directed by the highly sought after Nordia Rose. With things now on the up and up Slash began to spread his focus, using his versatility to good use recording the smash hit "Poor People" on the Medallion Riddim in "2005". The big breakout single had come and Slash was more than prepared for the calling as the song went on to become a reggae international favorite. The Poor People video captured Slash in all his glory as he portrayed the general mood of the track on camera scooping some 12,000 views to date on the popular youtube website. Presently promoting his new single "Wine Up Your Body" Slash is slowly but surely making his mark and before long will be performing amongst the local elite.